Less than a week after Pinterest announced it was getting into advertising with Promoted Pins as part of an experiment to, well, make money, the company has now revealed a new feature aimed squarely at those who like to share, gather and read articles. While people have been pinning anything from movie stars to fashion accessories on Pinterest since it launched three years ago, it seems people also like to pin articles – 5 million are pinned each and every day, according to Pinterest. Now, article pins from publishers are being given a distinct look, with more information including authors, headlines, description and links displayed directly on the pin. 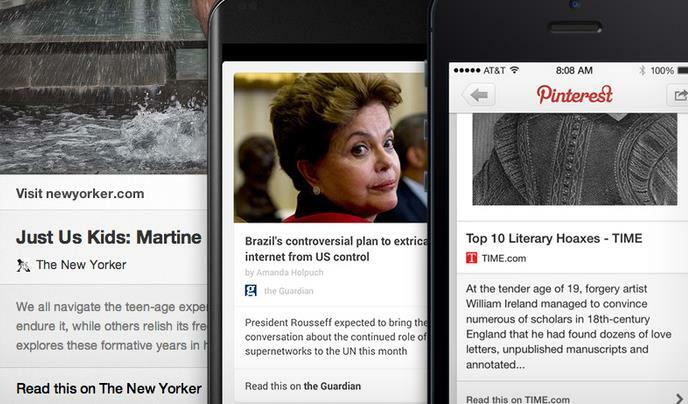 So this is Pinterest pushing for a market that’s currently occupied by read-it-later services such as Pocket. So, you can create your own pin-based reading boards, and peruse what users such as Arianna Huffington are reading. The new look article pins should be arriving on the Web version today, with mobile following suit “soon”. Publishers wishing to get this new look for their articles need to visit the developer site, add the appropriate metatags, validate their chosen rich pins and then apply to Pinterest. A number of publishers are on-board for today’s launch, including The Guardian.